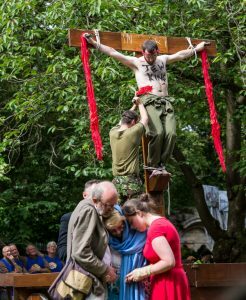 As in previous years, the Butcher’s Guild are performing ‘The Crucifixion and Death of Christ’, a powerful piece that stages the events immediately leading up to Christ’s sacrifice, on a purpose-built waggon. Presented by St Chad’s Church, on behalf of the Butcher’s Guild, this year’s interpretation of the play will be modern, vibrant, and colourful, while preserving the integrity and power of the original text and the story it tells. Katie Smith (Associate Director, Takeover 2017) will direct. We are opening up all roles – the soldiers, Jesus and his disciples, the thieves – and most roles are being cast gender-blind, so everyone is welcome. Performances will take place on Sunday afternoons of the 9th and 16th September, with an evening performance on Wednesday 12th September. Rehearsals will be held on most weekends throughout the summer. We also seek a Production Manager/SM (the role is flexible!) If this sounds like something you’d be interested in, contact us at crucifixion2018@gmail.com and tell us about yourself. Any questions, just email us and we’ll be happy to help. We look forward to hearing from you!